Of the several uprisings and pro-democracy revolutions sweeping through the Arab region, only two — Tunisia and Egypt — have been successful so far in toppling despotic rulers and embarking on a transitional process to establish a free democratic system. The transitions in the two countries have been far from smooth. In Tunisia, the election of the Constituent Assembly, initially scheduled to take place this July, has been postponed to October to give political actors more time to prepare for writing a new constitution. Egypt has been experiencing similar calls for delay. Some groups are advocating a “constitution first” process, contrary to the results of the referendum that took place in March, and are urging the postponement of legislative elections scheduled for September. In both countries, the structures of the old regime have not been completely dismantled. An atmosphere of mistrust among political elites, particularly between liberals and Islamists, is precluding the emergence of needed consensus on key issues. Major differences exist on such issues as the nature of the state, the role of religion in society, and guidelines for creating a new democratic system. THE ROLE OF THE U.S. AND THE E.U. Against this background, policymakers in the United States and the European Union seem anxious to extend their help, in some cases unsolicited. Offers to facilitate the transitional process have ranged from loans and grants to the new governments to ease economic difficulties, to injecting millions of dollars into various civil society organizations and advocacy groups. Some 600 nongovernmental organizations in Egypt have applied for assistance during the transitional phase. The newly appointed U.S. ambassador to Egypt, Anne W. Patterson, reported to Congress in June that she is dispensing $40 million for the support of democracy in Egypt and that 600 nongovernmental organizations have applied for assistance during the transitional phase. Given that Islamists refuse to receive aid from the West, U.S. support will likely go to organizations and activists who share Western liberal values. The Egyptian minister of international cooperation and planning recently complained of interference by U.S. Agency for International Development in the internal affairs of Egypt. Providing aid to Western-oriented groups that have little support within the country is seen by some as an attempt to manipulate Egypt’s transition process. In these delicate and precarious times, Western policies need to be inspired by clear guidelines. A first principle is “do no harm.” Western policymakers should respect the wisdom of the Egyptian and Tunisian people, who have proven their mettle by overthrowing dictators without resorting to arms. U.S. officials should be sensitive to the will of the people of wordpress the region to govern themselves and to build responsive and accountable political systems. Policymakers should be sensitive to the will of the people to govern themselves and to build responsive and accountable political systems. A second useful guideline is “do not interfere unless asked.” The emerging democracies in the region will certainly need help. Egypt and Tunisia already suffer from pressing economic difficulties because of the unstable context that revolutions generate and a lack of experience in transitioning to democracy. But offering help that is not wanted can be seen as violating the principle of self-determination. A new basis of cooperation and true partnership not dependency and submission needs to be developed. The U.S. should work with all groups that are pledged to respect the electoral process, including Islamic groups. The West should not favor one side over another. This will be perceived as interfering in the elections or trying to influence the transition process to serve Western purposes. The U.S. should work with all groups that are pledged to respect the electoral process. This includes Islamic groups, which have substantial popular support in Egypt and Tunisia. Many in the West fear such groups, but organizations such as the Muslim Brotherhood have a long history of resistance to tyranny and have recently acted with moderation in seeking to work with other parties and factions. In Turkey the moderately Islamist Justice and Development Party of Prime Minister Erdogan has acted responsibly and won substantial public support in free and fair elections. The U.S. should respect the will of Egyptian and Tunisian voters. We should agree to work with all parties that have the support of the people and that respect the principles of freedom and democracy that were the driving spirit of the revolutions. 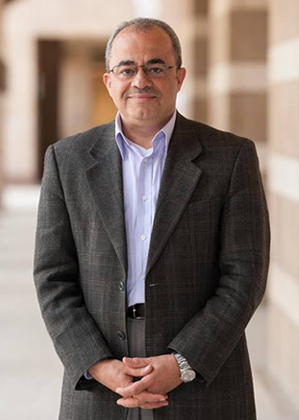 Emad El-Din Shahin is the Luce Associate Professor of Religion, Conflict, and Peacebuilding at the University of Notre Dame’s Kroc Institute for International Peace Studies.